Sunday night was a breakthrough for my culinary experiences. A breakthrough that is rather embarrassing- especially since almost everyone has made this food before. Not me though. Not until last night, that is. Last night, ladies and gentlemen, was the first time I made pancakes. Or one pancake, actually, but I only have one mouth to feed. Yes, last night was breakfast for dinner. And yes, it was my first time ever making pancakes. Embarrassing, I know. In my defense, we didn’t have pancakes in Poland. And my mom never made them when we moved here. The only time I really ever had pancakes was when I went to brunch with someone. I thought it was about time to change this. 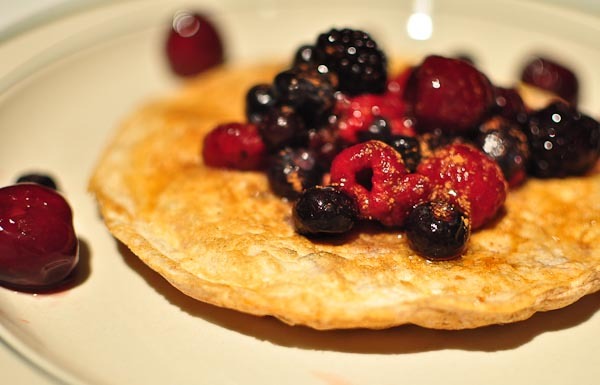 I thought of pancakes as indulgences because I know they aren’t usually the healthiest option on the resto menu but I know there are ways to make them healthy. This is exactly what I did. The outcome.. wow. Extremely easy and yields such great result. Such a great outcome. Yeah, it’s silly for someone to think “oh my gosh, I made such great pancakes last night!” but for me, this is an accomplishment! I told you guys before, I am totally new to the kitchen and any time I make something that turns out better than well is just amazing to me. So yeah, this pancake will most definitely frequent my breakfast (or dinner 😉 menu from now on. I can already see it… such a great post-workout breakfast. I’m excited already. However, the only reason why I made these really was to get rid of the lasts of egg whites I had in the fridge so I could be ready for the vegan challenge which starts today. So yeah, I have to say goodbye to egg whites and honey for a while. I’m developing a newfound love for oats. Ready! OMG! My first pancake! In a small bowl, combine all ingredients and let sit for 10-15 minutes on the counter to let the oats soak through and soften. Once the mixture is ready, spray a skillet with cooking spray and set on medium heat. 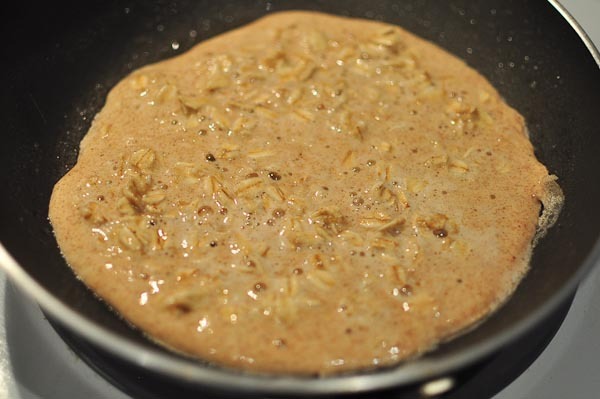 Put the mixture onto the pan in a circle shape like a pancake. Let cook. Move the pan around to check if the bottom is cooked. 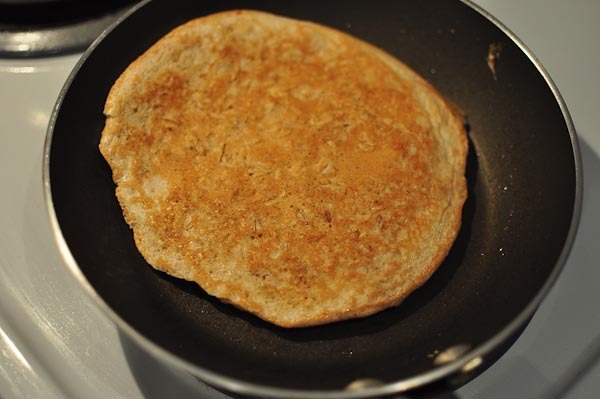 The pancake is ready to be flipped once it moves around on the pan whilst moving the pan. Flip the pancake and cool for 2 more minutes or so. Similarly, you’ll know when it’s ready by moving it around. 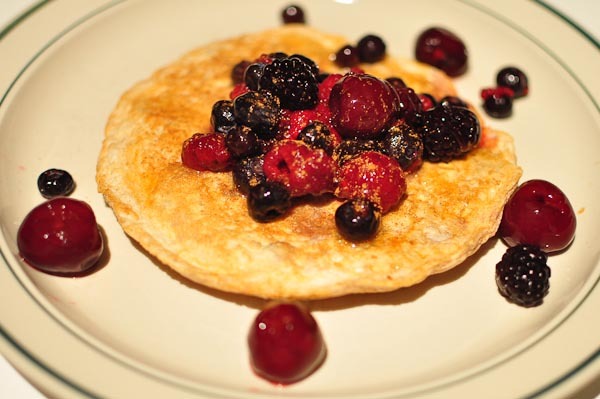 Top with frozen rinsed through berries (same method as used for my healthy banana split) and honey. Note: it’s better to burn it slightly than to undercook. 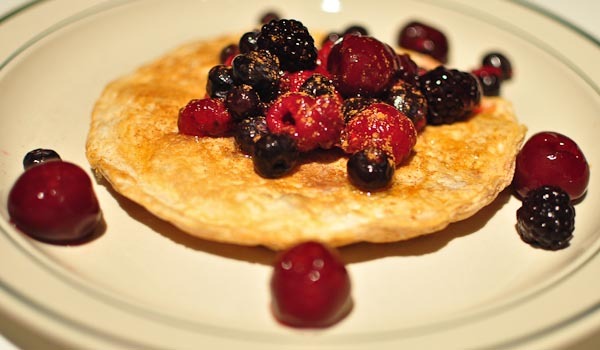 At what age did you make your first pancakes? 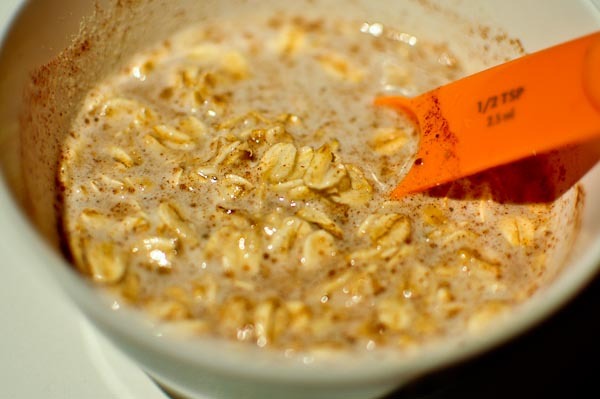 Do you ever use oats in anything other than oatmeal? The first time? that’s actually quite impressive – they look so good. I’ve only very rarely made pancakes myself. They are delish though. Thank you! & Ah, good I’m not alone (kinda) lol yeah, they turned out really well. I usually try to avoid them because of the excess sugars they contain in diners but I’m all for it now that I know how to make a healthy version. These look great–but sorry, eggs aren’t vegan. 🙁 If you do add a vegan option, feel free to link up again. 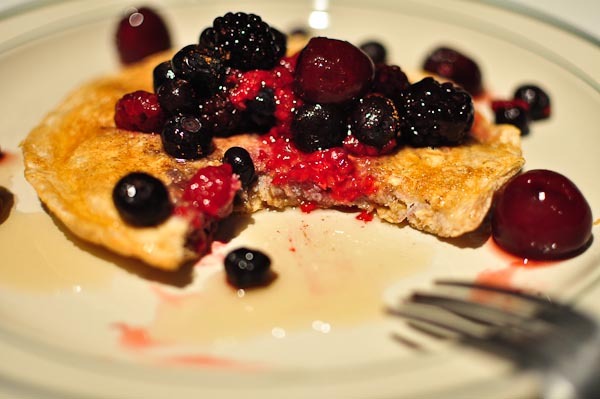 What delicious pancakes-these would be gone very quickly at my house! 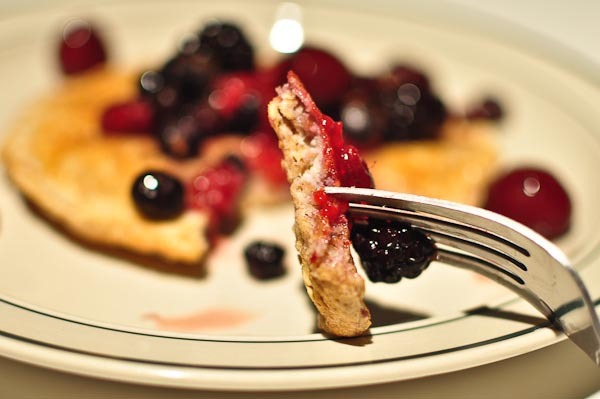 Thank you so much for sharing your great recipe on Allergy-Free Wednesdays! As a reminder, in order to be featured please provide a link back to one of the AFW Hostesses. Be sure to check back next week for recipe highlights (including the top 3 reader choice submissions and hostess favorites). Mmmmm…I LOVE PB2 powdered pb! Great recipe Kammie!! Thank you for sharing on Fit and Fabulous Fridays!